Boiling hot this summer and looking for a healthy cool down that you can make in less than 5 minutes? Try this yummy summer slushy. The consistency is just like a slushy, sip it with a straw or eat it with a spoon and enjoy a treat with no added sugars or sweeteners. Kombucha is naturally fermented, so it has a bubbly, carbonated taste that’s pretty subtle when combined with watermelon and blueberries. 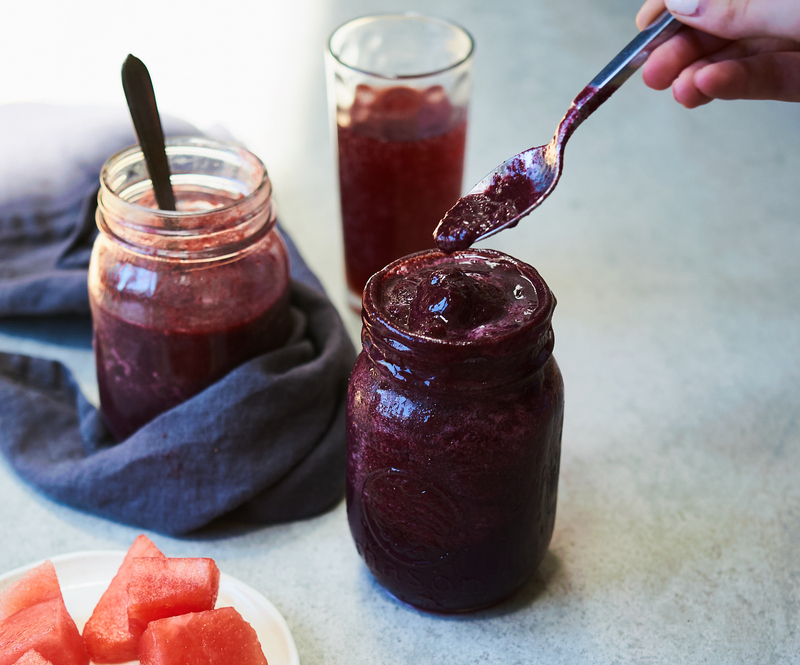 We wanted to find a creative way to incorporate kombucha into this recipe so that you can get the health benefits of fermentation- it’s a great source of probiotics and gut friendly bacteria that support digestion. Some research has also been done to understand the antioxidants found in kombucha, which can help reduce inflammation and help protect cells from damage. Kombucha is a good source of B-vitamins, particularly vitamin B12 which is an important nutrient for mental health. There are so many different companies that make kombucha these days so just make sure that you read the label and choose a brand that has a lower sugar content. We’ve also used blueberries in this slushie recipe. Although blueberries are small, they contain a large amount of nutrients, in fact they they have the highest level of antioxidants of all commonly used fruits and vegetables. These antioxidants help protect our cells from damage, by neutralizing free radicals that otherwise could cause DNA damage. Multiple studies have shown that blueberries protect against DNA damage which helps prevent cancer. Blueberries also contain fiber, vitamin C, vitamin K, and manganese. This slushie is delicious and requires little to no effort to whip up quickly in the blender. Let us know if you give the recipe a try! Place all ingredients in a high-speed blender and blend into a slushy smooth mixture forms. You’ll want it to be thick, so you can add additional ice cubes or frozen fruit, if needed.